Barbour "Classic Beadnell" utility jacket in Sylkoil waxed cotton with tartan lining. Two-way zip front; snap placket. 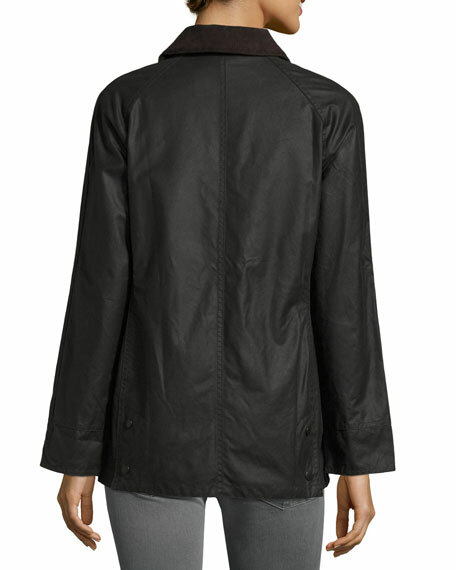 Barbour "Laggan" A-line jacket with breathable waterproof finish. Spread collar; button straps at shoulders. Long sleeves; adjustable button cuffs. A-line silhouette. Side welt pockets. Mid-thigh length. Polyester/cotton outer shell. Polyurethane membrane. Polyester lining. Dry clean. Imported. 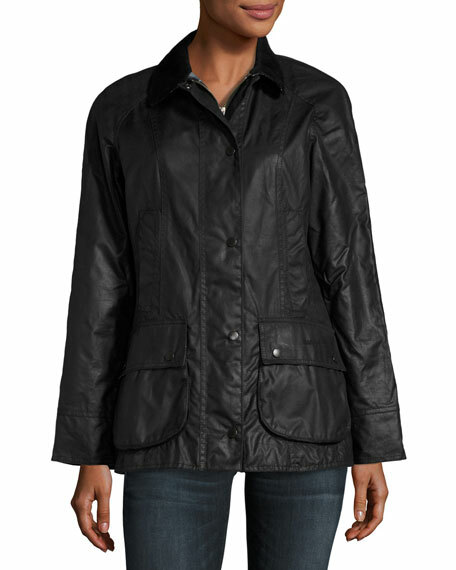 Hunter metallic jacket with contrast zippers. Packs into bag attached at neck. Hooded collar with drawstring. Underarm eyelets for ventilation. Hunter metallic jacket with contrast zippers. Packs into bag attached at neck. Hooded collar with drawstring. Underarm eyelets for ventilation. Long sleeves; elastic cuffs. Standard silhouette. Side zip pockets. Drawcord hemline. Nylon/polyester. Machine wash. Imported.